Director David O. Russell is clearly hot property at the moment in Hollywood with The Fighter (2010) and Silver Linings Playbook (2012) both being critical and commercial back-to-back hits. His new film American Hustle appears to be following in their successful footsteps as it’s sprawling with O. Russell’s signature trademarks; unpredictable storytelling, rich unusual characters, explosive confrontations and extraordinary performances. American Hustle also reunites several actors who have already collaborated with O. Russell such as Christian Bale and Amy Adams who worked with the filmmaker on The Fighter (2010) and Bradley Cooper, Jennifer Lawrence and Robert De Niro on Sliver Linings Playbook (2012). Set in the swingin’ 70’s, American Hustle appears to be David O. Russell’s take on what could be called The Goodfellas genre, although the film’s an intentionally overripe comedy about corruption, duplicity, loyalty and love. As the picture’s opening title card suggests ‘some of this actually happened,’ American Hustle is a fictionalized telling of the ABSCAM (short for Abdul scam) scandal of the late 1970s and early 1980s, an FBI operation that began as an investigation of trafficking in stolen property, but was later expanded to include political corruption. The film revolves around Bronx-born Jewish Irving Rosenfeld (Christian Bale), an over weight, balding conman with dreams of becoming extremely rich, really quickly; Irving eventually falls for the cunning and seductive Sydney Prosser (Amy Adams) and the pair are a match made in heaven. Together the duo expand their blooming enterprise, but their idyllic days of easy money are cut short when they are caught by Richie DiMaso (Bradley Cooper), an FBI agent who is determined to fry bigger fish. In order to save their skin, Richie manipulates Irving and Sydney into a series of set-ups in order to trap a large number of criminals and politicians including New Jersey Mayor, Carmine Polito (Jeremy Renner), a decent man willing to cut a few corners in the service of his hard working community. Eventually Richie’s neatly stacked house of con-jobs starts to shudder and shake as arrogance, greed and jealousy pick away at the already threadbare alliance. The situation becomes even more problematic when Irving’s unhinged neglected wife, Rosalyn (Jennifer Lawrence), is eager to hone in on the action as her unpredictable nature could inevitably pull the thread that brings the entire plan crashing down. Just like O. Russell’s last picture, Sliver Linings Playbook, what truly elevates American Hustle are its full-blown kooky characters; you see, these characters begin crazy and end crazy, they don’t do drugs, there is no rise and fall arc, they are what they are from start to finish and it’s a delight to watch them throughout the show. As usual O. Russell achieves some terrific performances, particularly from the four leads. Christian Bale, The Dark Knight (2008), gives a terrific portrayal of Irving Rosenfeld, expertly capturing the way an obviously unattractive person can exert magnetism to those around him; he looks and sounds the part to a tee. Bale achieved the physical traits of his character by gaining over 40 pounds, getting a comb-over and slouching his posture, consequently damaging two of his disks in the process. Bradley Cooper, The Hangover (2009), goes crazy as the reckless hothead Richie DiMaso, giving another excellent performance as a man on the edge, willing to do anything for success. Amy Adam’s, Man of Steel (2013) sizzles as the confident Sydney Prosser, usually clad in revealing dresses baring her perilously positioned breasts, yet even they have their place, establishing the complexity of a character who freely exposes all to the world, baring the truth of who she really is. Strangely though, it’s the film’s second-tier characters that truly steal the show, predominantly Jennifer Lawrence, The Hunger Games (2012), as Irving’s wife, Rosalyn, cementing her place amongst the Hollywood heavyweights. Part seductress, part clown, Lawrence moves seamlessly between the two extremes with such ease and speed generating most of the picture’s biggest laughs. Jeremy Renner’s, The Hurt Locker (2008), Elvis-haired Carmine Polito is a great little character and it was surprising to see Robert De Niro, Goodfellas (1990), pop-up in an unaccredited role as a mafia hotshot in easily the most gripping scene of the film’s 138 minutes. It’s clear that director O. Russell has a passion for observing actors and giving them space to create chaos within his control; according to Bale much of the movie was improvised. During the shooting of the film he noted to O. Russell, ‘You realize that this is going to change the plot greatly down track,’ to which the director replied, ‘Christian, I hate plots. 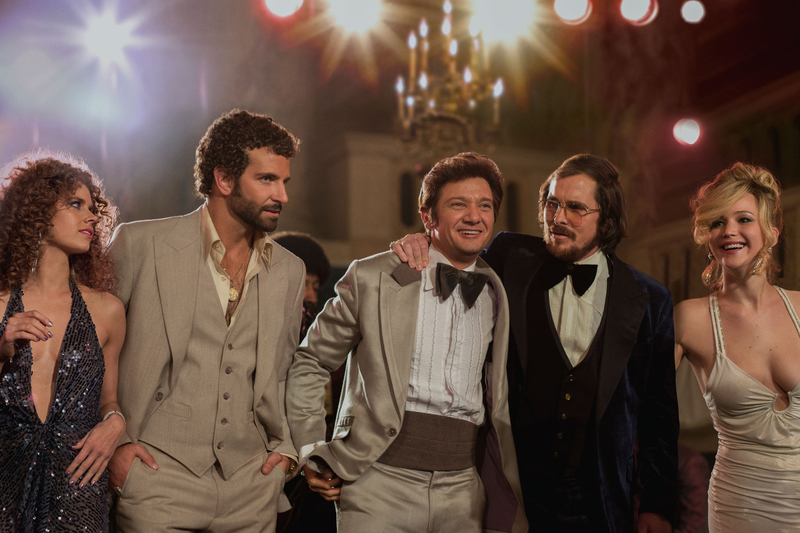 I am all about characters, that’s it.’ Besides outstanding performances from one of the best ensemble casts of the year, American Hustle is about outfits, hairstyles and its period soundtrack. Most of the picture’s eye-popping wardrobe works, from Adam’s outrageous plunging necklines to Cooper’s ridicules perm, every costume and hairstyle fits into the film’s flashy/trashy 70’s aesthetic. While most of the soundtrack works, some of it is a bit uneven, with tracks from Chicago and Steely Dan feeling a bit disjointed. As this was clearly O. Russell’s ‘Scorsese’ film, it’s clear O. Russell isn’t Scorsese; he doesn’t create exciting shots with the camera or place it in interesting locations, O. Russell is much better suited to longer takes, more focused on character interaction and exploration. Here O. Russell’s distinctive music cues and larger camera moves don’t always work, but in reality, this never really detracts from what ultimately matters in American Hustle. Yes, American Hustle is long, and it certainly drags from time to time, however, it’s a multi-layered and captivating picture that’s immensely funny and is overflowing with show-stopping performances from some of Hollywood’s best. American Hustle is definitely on the festive season’s ‘must watch’ list! It’s definitely a flawed movie that never quite comes to terms with what it wants to be, how, or at which time, but damn, if I didn’t have fun with this thing! Good review. Hahaha, it’s all about the performances, which were top shelf stuff!